So, you’ve learned & completed your dressage test. However, your score wasn’t what you expected. Unless you were beaten by Charlotte Dujardin and Valegro, you can find ways to improve your dressage marks. You know how it works, you do the movement and then are scored out of ten for each of them. If you’re riding pure dressage, obviously the test is everything. With eventing you have two other phases to contend with. Still, relying on the other two phases to get you a place, if your dressage isn’t good enough, isn’t always an option. When I think of great dressage there’s two people I think of. The first is Charlotte Dujardin and Valegro, they’re just, wow! They seem to do everything perfectly and effortless. The second person is a much more realistic goal, Michael Jung. Bear with me. You don’t watch his test in awe for the same reasons you do with Valegro. He doesn’t get tens, more realistically he gets dressage marks of seven. Most importantly, every movement consistently gets the same mark. This adds up. His tests are always quite sweet, there’s no issues but there’s no heart stopping moments either. Yet he’s still up the top of every leader board. He’s won more than you can count and is the eventing worlds Charlotte. So why does he win so much on not overly special horses. Training is why. They are almost unflappable both cross country and showjumping, he knows you can lose an event in day one. Unless you’re Tim Price, who went from 34th to 3rd in Badminton 2017. When you watch Michael’s tests, his movements are consistent. With each starting and ending where they’re supposed to. Along with this the movements all happen as they are technically required to. Michael has his horses well-schooled and does not throw away marks. So basically, I’ve used Michael as an example of how utterly important accuracy to improve your dressage marks. Take circles for example, every dressage test you ride normally has at least two. My current novice and elementary tests have 11 circles and half circles combined. If they can all be improved upon by even one mark, then that’s an extra 4%! With such competitive classes, how can you and I both be throwing away easy marks like that? Your horse doesn’t know how big a 20-meter circle is, you have to ride it for them. You should aim to have no comments like “too big”, “too small”, “late” or “early” written on your test. Otherwise you’re at risk of throwing away valuable dressage marks. Many of us focus on training our horses in the more complicated movements, but how many of us go back to riding the simple circles. I know roughly how far over a 15-meter circle goes. One out of three times, I’ll get that dreaded “inaccurate” comment on my score sheet. This is down to me winging it – “it’s only a circle”. So, go on foot and measure that circle out. Especially if it’s an odd size, like a 12-meter circle in the middle at A. For a 20-metre circle at C, I try to ride it like a ball that’s squished into a box. There should be four obvious straight tangent points in order for that circle to look round. Along with circles, straightness can be a basic exercise we all miss. How many of us wobble down the centre line, halting with the horse’s head facing one way and their quarters facing the other. When schooling at home go down the centre line every so often in all paces. Don’t leave it down to chance to be straight up that centre line. 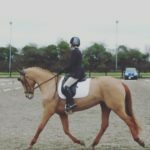 The straightness and accuracy of your test is just (if not more so) as important as riding those difficult movements and will help improve your dressage marks. To help you understand better how to improve your dressage marks and give you a visual aid, find someone who’d be willing to record you. Have them do it from C, this way you can see exactly what the judges see, and those comments might make more sense. You can download apps that slow your video down, as well as allowing you to draw over them. This can break the test down into sections of movements and you can assess your straightness. At shows my lovely volunteer camera crew will record from behind A, this way when watching back with my score sheet it makes sense. There’s a lot of “oh I wasn’t actually straight” or “I did wobble”. My new mantra, shall we say, is to practice everything and more importantly practice in the correct size dressage arena. For me this means making it out of poles in a field. Making a DIY dressage arena can make all the difference to riding your test at competitions and can help to improve your dressage marks. You don’t have to drill your tests repeatedly but do pick certain bits you’re not sure of. Ride through them till you’re happy with your performance. If you have a big competition coming up like a championship or just anything that’s important to you. I find that booking lessons that are purely focused on test riding are a good idea in preparation. It should make all the difference, even if it’s just for the reassurance that you’re doing a good job. Finally, there is also the option of uploading your dressage tests online. This way you can gain feedback from judges who can review and score your test as if it were a live competition. Sometimes there even online dressage competitions that you can participate in. While nothing compares with being out there and competing in live dressage competitions, this can be a great training aid as well as an option when life gets in the way. Dearbhle is currently studying Mechanical and Manufacturing Engineering at Trinity College Dublin. She campaigns her two horses Tilly and Dave. Tilly is a 12-year-old chestnut mare, who after a turbulent eventing career is now successfully competing in pure dressage. Dave is a baby 4-year-old who is only starting his competition career. The hope for Dave is that he makes it as a successful eventer. He’ll be brought on with the ambition of competing at international one-star level by the time he’s 7!